Your Dream Vacation Luxury Condo Awaits! Overlooking Greens at Los Sueños! Golf Cart is included on reservation during Green Season May 1st _ Dec 15ht 2018, minimum 5 nights stay. Offer can not be combined with other promos. Del Mar Condominiums offer sweeping views that overlook the heart of the resort and beautiful Herradura Bay beyond. A shaded, lazily curving path connects the Mediterranean-style condo community, complete with 2 free-form swimming pools and Jacuzzis, Palapas and barbecue areas. Located near the front gates of Los Sueños Resort, the Marina Village shopping center, Marina, Beach Club, and other resort amenities are just a short golf cart ride away. The open-plan living area allows the kitchen, dining, and lounge spaces to open to a ground level terrace, perfect for drinks and dining al fresco at sunset. The interior décor, featuring ceramic tile floors, wooden cabinets and soft colors, creates relaxed atmosphere of paradise in the tropics. The master suite also opens onto the gardens, creating a cozy and romantic haven. Two other beautifully appointed bedrooms share the second bathroom, with a tub/shower combo. The ground-floor terrace and lawn, with screening hedges, are perfect for families vacationing with young children; they’ll have plenty of room to run! Hello there, my name is Michael Hardy I own and manage several properties within Los Suenos Resort & Marina. I also live in the resort and spend much of my time designing vacation packages for friends, customers, and relatives. HRG Properties & Rentals provides the best vacation planning services in the area at the best prices. Your enjoyment is our goal, inquire today to find out about how we can design the perfect getaway in one of our exclusive properties. Originally from San Antonio Texas I moved to Costa Rica in 1998 after graduating from UT Austin. I packed up my car and drove from Texas to Central America to take a job offer from the developer of Los Suenos Resort & Marina. We opened the 200 rooom Marriott Hotel in January 2000 and I stayed on for another eight years before opening my own real estate and vacation rental company. I live in Resort, work here in the resort and am always accessible - unlike other absentee owners or large management companies that you may find on VRBO. I promise you will get personalized service from me and my staff. You can contact me directly with any questions during or prior to your visit. Call or email today to find out about current specials offers. There are several reasons why I choose to make Los Suenos Resort & Marina my home for work and play. Simply put it provides the best of what Costa Rica has to offer in all regards. Proximity to the airport, the best tours and activities, world class sport fishing, and most important North American quality residences all within a Jungle Setting. 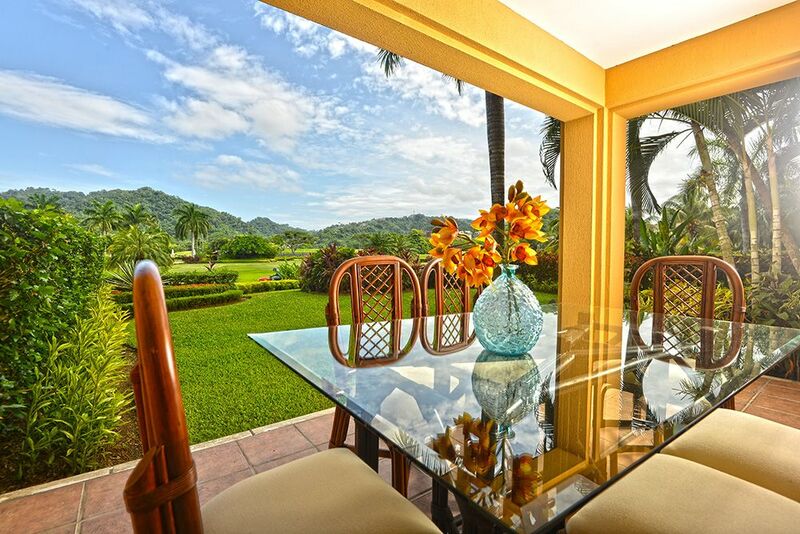 Everything in Los Suenos works perfectly and you can walk or take a golf cart to all of the resort amenities. This property is one of the few beach front condos in the entire country. With a view of the Los Suenos Beach Club, Herradura Bay, Los Suenos Marina, and Pacific Ocean Beyond this is a very unique vacation property. It will take your breathe away upon entry and the expansive patio is perfect for watching sunsets, nature, and the boats coming in after a long day of fishing. Enjoy Scarlet Macaws as they roost in the trees directly above patio. •	Daily housekeeping service •	Full service concierge desk •	3 bedrooms & 2 baths •	Spacious living & dining areas •	Modern well equipped kitchen •	Private laundry facilities •	Private terrace •	Ocean, fairway and sunset views •	3 large community pools •	Barbecue areas •	Private community fitness facility Guests can enjoy access to the resort’s world-class amenities! •	200 slip Los Sue��os Marina •	18-hole championship golf course •	Private beach club •	Two luxury day Spas •	The Marina Village retail center •	Twelve different dining locations Other available services include: in-house massage and spa services, in-house chef and catering, comprehensive tour services, full time driver and guide, restaurant reservations and recommendations, golf, sport fishing reservations, golf cart rental, automobile rental, dry cleaning, 24 hour medical assistance, Real Estate consultants and baby sitting. We are glad to hear that you enjoyed your stay. Great to hear that you had a relaxing time. OUR STAY WAS AMAZING!!! LUIS WAS EXCEPTIONAL!! HE TOOK CARE OF EVERY NEED WE HAD!! Our stay at Los Suenos was absolutely wonderful! Luis, our concierge, made sure EVERYTHING was taken care of and that we had the absolute time of our lives. Luis gave us excellent restaurant and excursión recommendations and took care of any needs we had along the way. The resort is beyond beautiful. This is truly Paradise! The condo was phenomenal and I can´t say enough positive things about Luis. We will definitely return to this Paradise! I am so glad to hear that you had a great vacations with us. It was a true pleasure to have you staying with us. Our goal is to create exceptional stay. We are looking forward to having you stay with us again. costa rica- the best vacation ever!! What a beautiful country. People are so nice. Will definately come back again to visit this beautiful country. luis took great care of us. Cant ask for the better service. Costa Rica, the rich cost is a true paradise. We are so happy that you choose to stay with HRG. It was great to have you staying with us. We are looking forward to having you back! I would like to start by saying thank you to Ricardo Rojas and Luis Gonzalez, hospitality was out of this world. The condo was beautiful, clean, safe and a wonderful location and everything Ricardo descripted. I would highly recommend HRP Prop the follow through and communication outstanding. I appreciated Luis sending us attractions and information about fishing, golfing and the restaurants. We fished for 5 days at $1400 per day because of the information sent to us from HRP properties. Thank you and we will be back soon. Hi, Thank you so much for taking your time to leave us a review. It was a pleasure to have you staying with us, and we are looking forward for you to come back. Conveniently located at the Los Sueños entrance, Del Mar is undoubtedly the perfect spot for quick and easy access to local attractions and restaurants that lay just outside the gates of the Resort. Your Del Mar luxury condo provides the perfect base from which to explore the riches of Costa Rica’s Central Pacific Coast! High Season: Jan 04 - April 30 $520 per night. minimum 3 nights. Peak Season: Dec 15 - Jan 03 $700 per night. Minimum 7 nights. Golf course view unit / Rate plus Taxes 13% and fees.